Home birth stories - Alexis got her dream home birth for her third child. Alexis had a home birth... then hosted her daughter's 3rd birthday party a few hours later. Mum-of-three and doctor of dietetics, Alexis Hure, is the woman to talk to if you are pregnant and in need of a positive birth story. After delivering two gorgeous girls, Frieda in August 2012 and Marlo in January 2015, Alexis hoped to have her third baby at home. 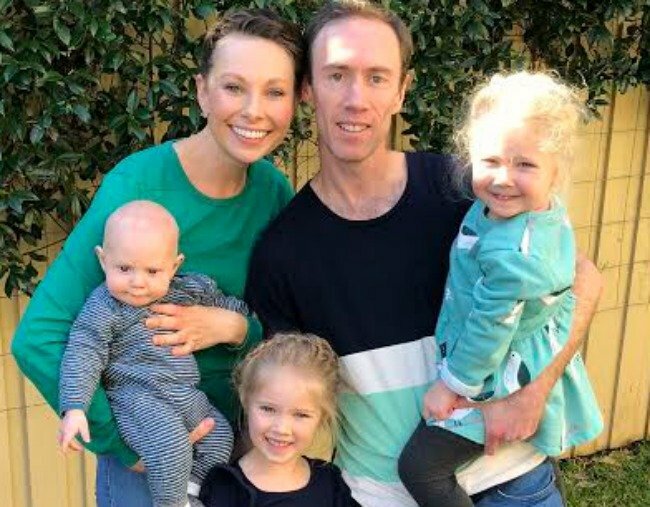 Before their first baby Frieda came along, Alexis and husband Damien, a medical doctor, took a ‘Calm Birth’ course that gave Alexis the confidence to try for a natural delivery first time around. “Everything went smoothly with Frieda and I was so lucky to have excellent midwife support during my pregnancy and labour at the midwife-run Belmont Birthing Service. During labour with Marlo however, I was transferred by ambulance to the John Hunter Hospital, after my waters wouldn’t break. Alexis with her third child. Image: Supplied. As her due date got ever closer, Alexis realised there was a high chance baby number three would be born on daughter Marlo’s 3rd birthday. To distract herself from the labour pains, baking enthusiast Alexis made Marlo’s birthday cake before trying to relax in the shower and having a couple of hours sleep. Just before 3am and after a lot of pacing, Alexis called the midwife as her contractions were becoming extremely intense. The last hour of Alexis’ labour was an incredibly intense period that not many couples get to experience privately. “The birth of a baby is always wonderful, but it was just Damo and I at home so it felt particularly special. As a doctor, he did go into ‘medical mode’ and was obviously worried about all being well, but he also ran my bath, made me tea and held my hand like any other husband and excited father-to-be would. "The birth of a baby is always wonderful, but it was just Damo and I at home so it felt particularly special." Image: Supplied. By the time Damo placed Emile on Alexis’s chest, the midwife had arrived to clamp and cut the cord and was thrilled that all had gone to plan. With no tears or stitches, Alexis didn’t need to transfer to hospital. As the happy hormones kicked in, Alexis watched the sun come up from the comfort of her own bed while feeding Emile for the first time. Alexis with her daughters (featuring the cake she baked while in labour). Image: Supplied. With just a few hours until the start of the family party, Alexis decided to carry on as planned with the celebrations. Alexis knows how extraordinary Emile’s arrival and first few hours in the world was, and realises it is not possible for everyone. “I had a great experience third time around, but I know birthing is not always straightforward. I suggest pregnant women talk to their doctor or midwife before making any decisions about where or how to give birth. What was your birth experience like? Tell us in the comments section below. The views, information, or opinions expressed in this article are solely those of the individuals involved and do not necessarily represent those of Mamamia. For further information on home births please consult a health care professional.